I've been a bread lover since I was a little girl...but this is one thing I don't owe from my mother. As I've told you before, we didn't have an oven when I was growing up so my mother never baked bread. I owe my love for bread to The De Castro's, my childhood friend's family who owns Halina Bakery. This bakery has been selling the best tasting Filipino breads in the City of Calapan since I was a little girl until now. It is now being managed by my friend, and I must say that just like her parents, she's really doing a great job. I remember that there was this other bakery much closer to where we used to live, but we would rather go to Halina Bakery to buy pan de sal, loaf bread, ensaymada, pan de coco, monay, pan de lemon, pan de agua, kalihim, mamon, puding, spanish bread and hopia. All their bread really taste a lot better than those of the other bakery. I'm not saying this because it's owned by my friend. It's just how it is. One of my most favorite bread from Halina Bakery is the Pan De Coco which means Coconut Bread. It is a soft sweet roll with sweetened coconut filling which I loved having for afternoon snack. My mom would always buy it in dozens 'coz my brother and I never seem to get enough of it. 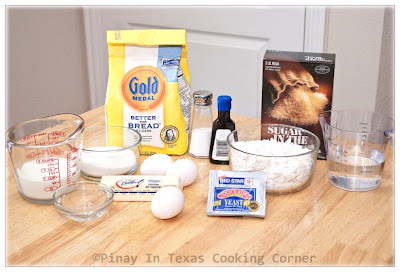 Last week, I thought of making Pan De Coco for the first time. 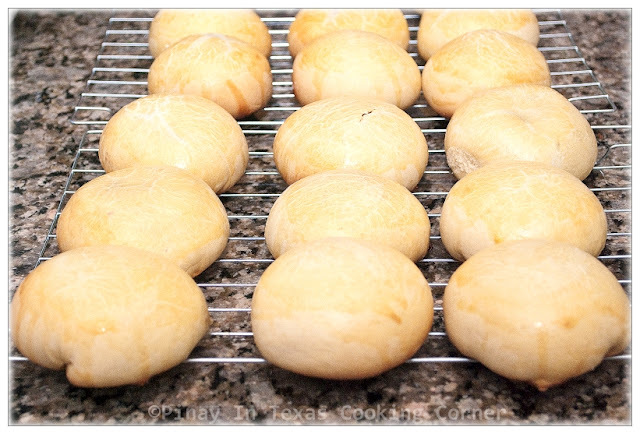 I tried experimenting with my Pan De Sal recipe to transform it to a much softer and sweeter roll with a shiny finish. Was I successful??? Well, kinda. It's good...but I think I have to work on the softness more. I'm not sure if I just over baked it a little or I didn't knead the dough enough. But the rolls were delicious and soft enough though not as soft as I remember the Pan De Coco from Halina Bakery. I still have some Haleyang Ube (Purple Yam Jam) so I filled half of the dough with it, and half with sweetened coconut. I came up with 9 pcs. Pan De Coco and 9 pcs. Pan De Ube and they are all gone in 3 days! 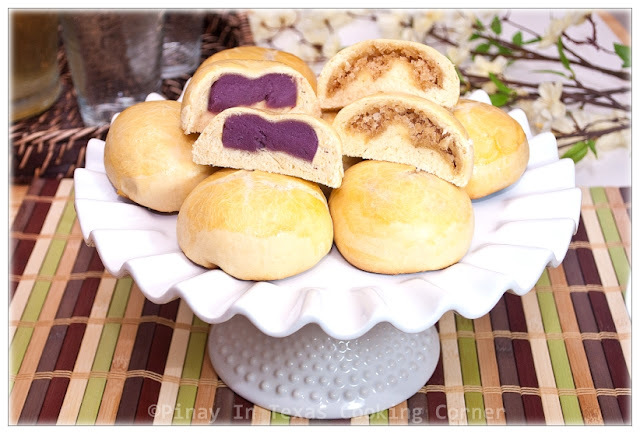 Clarise and Cherlin love ube so they both prefer the Pan De Ube more. Ryan, on the other hand, finds the Pan De Coco perfect for his coffee. 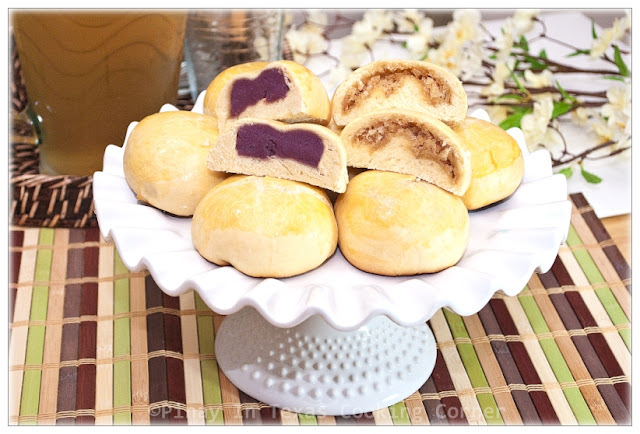 This Coconut and Purple Yam Rolls recipe is my entry to this month's Iron Chef Challenge at A Latte With OTT,A which is sponsored by Red Star, maker of high-quality baker's yeast in the country. For product updates and delicious tested recipes, visit their website or follow Red Star on twitter and facebook. 1. Dissolve yeast and ½ Tbsp sugar in warm water. Let stand for 10 minutes. The mixture should increase in volume if the yeast is active. 2. In a large bowl, combine bread flour, ¾ cup sugar and salt. Mix well. Add the butter, milk, eggs, vanilla extract and yeast mixture. Mix until well combined. 3. On a clean surface dusted with flour, knead the mixture into a smooth elastic dough. Shape into a ball and put back in the mixing bowl. 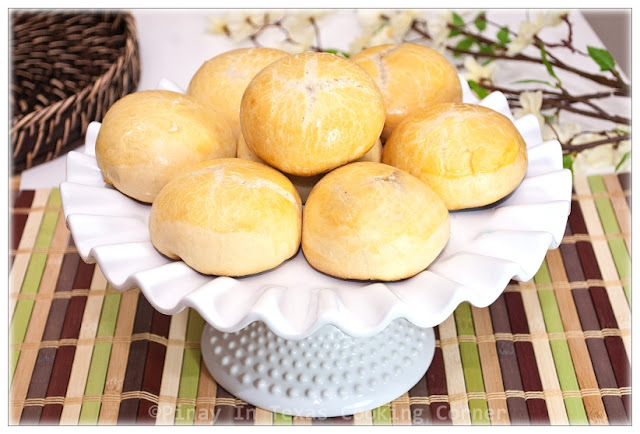 Cover the bowl with plastic wrap and let the dough rise for 1 hour or until it increase in size. 4. While waiting for the dough to rise, cook the coconut filling. Place all the ingredients in a saucepan over medium heat. Mix thoroughly and simmer with frequent stirring for 25 minutes or until water is all absorbed. Remove from heat and allow to cool down completely. 5. After rising, transfer the dough onto a lightly floured surface. Punch the dough, knead again and divide into three for easy rolling. Roll each piece of dough into a log about 2 inches in diameter. Using a dough cutter or a flat knife, cut the log into equal pieces of about 1¼-inch thickness. 6. 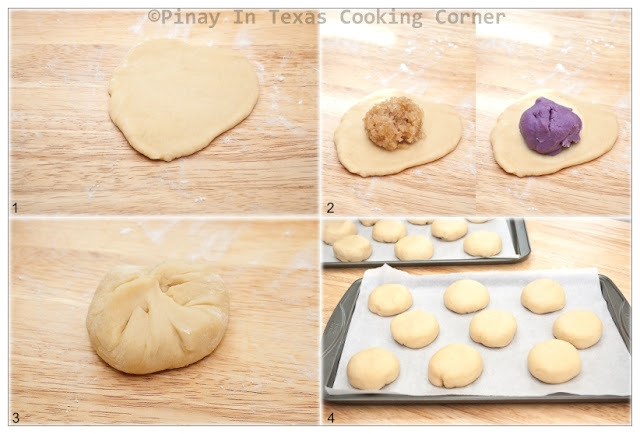 Using a rolling pin, flatten the dough into a round shape. Place about 1½ Tbsp of filling in the middle of the flattened dough. Gather sides and pinch together to seal. Place the roll with pinched side down on a parchment paper lined cookie sheet. Repeat the procedure for the rest of the dough. 7. Preheat the oven to 325F. 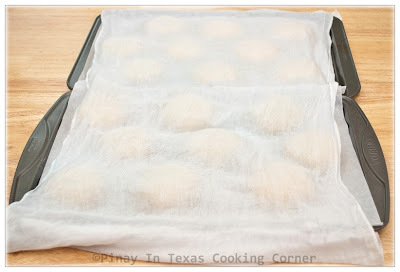 While preheating the oven, cover the tray with a damp cloth to let it rise some more. 8. Brush the top of each roll with egg wash to give a shiny finish. Place cookie sheets on the second highest level oven rack and bake for 20-25 minutes or until the bottom of the roll is light brown and the top of the roll is starting to crack. 9. Transfer to wire racks and allow to cool down a little before serving. Congratulations, Anna! Our friends from Next Day Flyers will contact you soon. My sincerest thanks to everyone who joined...and thanks so much to Next Day Flyers for sponsoring this giveaway!!! Love the look of that purple yam jam. Thanks for linking up to the Iron Chef Challenge and good luck!!! Wow, these sound delicious and are so pretty! Thank you! Nice to see you here! I love filled bread rolls like this. They are made in various ways by various cultures, but I have yet to try this particular variation. Ha-I think the buns without the filling would be tasty! However, now that you have them here with the filling, it makes them even more tempting. Those side pictures showing the filling do look amazing. They are a winner to me, so well worth entering in the Iron Chef Challenge-good luck! Thanks Tina! I'm sure you'll love them esp. the coconut filled buns! The rolls looks perfectly done and its beautiful color with purple yam in the middle,It's nice to make something good food, related to your chilhood,I remember my mom have square oven that we use on the traditional stove we call it "kompor" :) the things is help little bit to bake a little cake or cookies !! It looks delicious , Tina ! Love those different filling ! I , too , love these kind of bread back home ;) These sure are a winner ! Good Luck !!!! Wow. yun lang. you are so amazing! :D I need to make this SOON! The purple pop in the middle is so cool - is there anything you can't make look beautiful? Stuffing it with purple yam is a lovely idea. love the colors and I'm sure these tasted delish. Seems like we are opposites in that you like bread and I force myself to eat it when I don't have a choice. My other half on the other hand can eat bread everyday. Mine will always be rice even when I was younger. Having said that, I love yam and I am not sure its that way. The purple color yam looks so perfect into the bread and I am admiring the pics all the way. I remember good old days when I used to buy this kind of bread in a bakery near our house. Together with my friends we used to enjoy this. =)Delicious! I make stuffed bread for my family but haven't yet tried gluten free for myself. These buns look that you made it perfect the first time. I used to love all of those little filled rolls - my cousins and I would always head to the bakery. Never thought of making them myself though, and it was genius of you to try to adapt your pan de sal recipe. Wow, that purple color is beautiful! Love it! I made this yesterday with your recipe as my first time and they turned out great!! Thank you for sharing! :) evryone loves it! I am happy to know that baking these goodies turned out well for you! can i use all purpose flour instead of bread flour? t.y. Yes you may, but there will be a difference in texture and softness.